In the not-so-distant future, the United States of America has emerged as the last true superpower, ruling the globe with an iron fist called the Pax America. However, one frontier remains free of their grip: the Moon. Here, various countries have seized control of its resources in an attempt to loosen the stranglehold America has on Earth, one last hope at finding their own measure of independence. However, claiming right of domain by virtue of the original Moon landing in ’69, America is willing to fight for dominance, dispatching troops into space to take back the last bastion of freedom, anyway they can. In an army so wedded to advanced technology that a pirvate can’t even sneeze without being micromanaged by the brass, and so corrupt that an honest man stands a better chance of dying than being promoted, Sergeant Ethan Stark is the rare exception. Honest, blunt, fearless and loyal to the extreme, he’s dedicated to his man, and his job, with a passion. This mission will test his resolve and loyalties to the breaking point, and beyond. 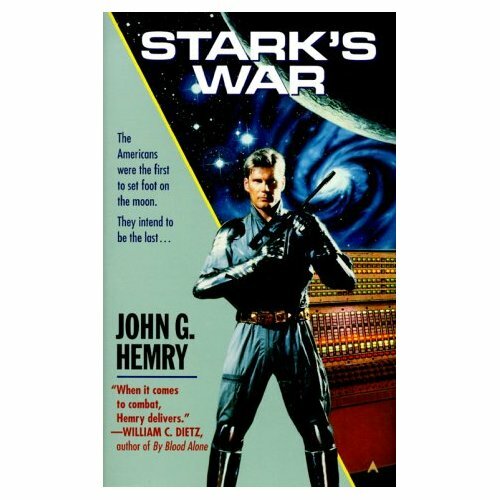 Newcomer John G. Hemry turns in a gripping tale of military science fiction in the tradition of Heinlein’s Starship troopers and Haldeman’s The Forever War. It serves both as cautionary fable and science fiction adventure, succeeding on both levels. The future society it portrays is a horrifying one, where personal aggrandizement and promotion are far more important than quality or loyalty, where military battles have become popular entertainment, and where the common soldier is nothing but a pawn to be carelessly discarded by a ruthless Army made up of career officers and politicians. It takes the very worst elements of today’s society and amplifies them in a logical manner, showing us a place where we might very well be someday. Ethan Stark, the protagonist and voice of common sense and morality, is a good man, plain and simple, who joined the Army to make a difference and be part of something grander. The events of Stark’s War force him to question everything he’s ever believed in or upheld, and the choices he makes will affect not just him, but the entire Army before it’s over. The characterization in this book, be it Stark, his closest friend Sergeant Vic Reynolds, or any of the many enlisted men and women who get screen time, is right on. These are real people dealing with real situations, often hamstrung by (admittedly over-the-top) uncaring officers and arbitrary commands. When someone dies, you notice it. The plot is sharp and crisp, moving right along at a mounting pace until it reaches the point of no return. While there’s a defined resolution, there’s plenty of room for a sequel, which will hopefully explore the new status quo created by the events within. This is a good book, a worthy debut from Hemry, and it has the potential to join the pantheon of classic military SF if it gets the attention it deserves. Give this one a try.